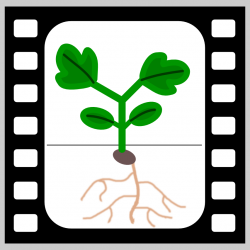 This is a time-lapse video of a close-up of a Fava bean germinating, forming its primary root and shoot, root hairs, and eventually lateral roots. Most striking is the movement of the root while looking for a substrate to burrow into. Eventually, the root manages to hook into a fabric thread and that stops it from thrashing around.